This point was borne out by the discussion on volunteer-run libraries on the Jeremy Vine Show where it was pointed out that Chalfont St Giles Library has retired librarians helping out. While this says a lot for the dedication of the ex-library staff in question and is certainly a help locally, sadly in the current climate, this simply encourages councils throughout England to close more libraries. So, if you’re a librarian reading this approaching retirement or, more likely, facing voluntary or compulsory redundancy, don’t consider going back to the job you love when you are “let go”. It’s heartbreaking but you would simply be helping to birth a cruel new world of libraries available only in wealthy areas, with unpaid employees – and underfunded/non-existing libraries in those areas not blessed with large numbers of retired professionals. Library staff up and down the country are facing people who seem to think that they can be got rid of and anyone who who fancies having a go can run a library. Don’t, for the love of libraries you have worked your life for, be one of them. “Do everything you can to support libraries – God knows, they need every bit of help they can get nowadays. I find it incredible and outrageous that public and school libraries are being forced to close – we’ll all pay the price in the long term.” Children’s Laureate: cuts are “outrageous” – Independent. Civil servants blow your cash on flowers, booze and gift vouchers – Mirror. DCMS spends £250,000 via credit card for flowers, expensive hotels, films. Councils that can’t afford libraries are still recruiting highly paid “sustainability” officers – Telegraph. Make it hard to privatize libraries, California Assembly says – Sacramento Bee (USA). Also reported in the Times-Union. Snoring snoozers upset library users – New Zealand Herald. Supporters give “hug” to budget-pinched NYC libraries – CNN (USA). Croydon – Council’s announcement on the future of libraries looms closer – Sanderstead Library Campaign. Less opening hours and more use of volunteers expected. Milton Keynes – Inviting ideas – Milton Keynes Library Service. Oxfordshire – Libraries facing uncertain future – Guardian series. 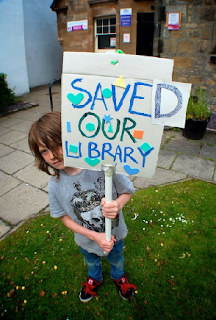 Warwickshire – “Horrific” plans to cut hours at Lillington library face criticism – Courier. Cut from 37.5 hours to 20 hours per week. Computer users charged. Warwickshire – Saturday morning review of the week – JohnnieB’s Blog. Review of workshop in setting up a community library. Wiltshire – cutting library positions – Wiltshire Times. 10 smallest libraries will open with help from volunteers. 13 full-time job cuts, self-service machines installed. Wokingham – Controversial library plans approved – Reading Chronicle. No consultation with schools or library users before decision to privatise approved. Also covered by the BBC. Print article This entry was posted by Ian Anstice on June 5, 2011 at 4:36 pm, and is filed under Uncategorized. Follow any responses to this post through RSS 2.0. You can skip to the end and leave a response. Pinging is currently not allowed. Maybe aging volunteers can be given the option of serving another area. It can be difficult to give up something you love doing so much.